What you should know about a Restricted Fire Zone! 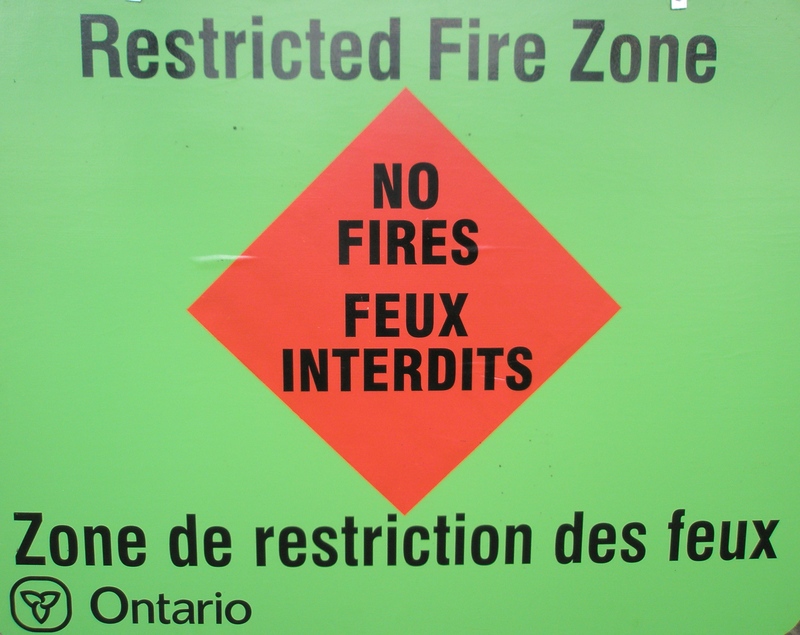 A “Restricted Fire Zone” is an Order made by the Minister of Natural Resources, under the Forest Fires Prevention Act, that restricts the use of open fires in a specific area of the province. It is used when the fire hazard is extreme and/or when fire fighting resources are stretched to capacity. A Restricted Fire Zone does not restrict movement or recreational activity in the forest, but it does restrict the use of fire. After a Restricted Fire Zone has been declared, it is illegal to set out a fire for any purpose within the affected area, and failure to comply could result in a fine up to $1,000, three months in jail, and financial responsibility for any costs incurred in fighting a forest fire caused by the illegal act. It’s a tough law, but a necessary one – one that’s helping save thousands of hectares of forest. When is a Restricted Fire Zone Declared? The Restricted Fire Zone Order is used only when conditions are so dry that an open fire of any kind, no matter how well tended, would represent a threat to the surrounding area. The decision to declare a Restricted Fire Zone is not made arbitrarily by any one person. It is the result of investigation, discussion and agreement on the severity of conditions by fire management staff and the Minister of Natural Resources. It’s a temporary measure reserved for extreme situations, and as soon as conditions permit, the restrictions are lifted. How Will I Know if I’m In a Restricted Fire Zone? Once a Restricted Fire Zone has been established, the Ministry of Natural Resources makes sure that everyone coming into the area is aware of it. The highly visible green and orange Restricted Fire Zone signs may be seen along roadways, at popular camping spots, in sport lodges, gas stations and stores. Large ads appear in local newspapers, and announcements are made on radio and television stations in the area. Can I Still Go Camping in a Restricted Fire Zone? Yes, by all means, go camping, hiking, fishing, have fun and enjoy our most precious natural resource, but if you need heat for cooking and warmth, you’ll have to take along a portable gas or propane stove. When travelling in a Restricted Fire Zone, exercise extreme caution. Watch your propane or gas equipment carefully. Smoke only when stationary, never while walking or working in the bush, and make sure that all matches or cigarettes are dead out before disposing of them. When an area has been designated a Restricted Fire Zone, you know the situation must be serious. Use your bush sense and act accordingly. Be careful with anything capable of starting a fire. Are There Other Stoves or Installations I Can Use During a Restricted Fire Zone? Yes. As previously mentioned, you can use a protable gas or propane stove anywhere and at any time provided it is at least 1 metre from any flammable materials and you use extreme caution. You can also use a charcoal installation (i.e. BBQ) but only if you are within 100 metres of a dwelling you own or legally occupy. In addition, your installation must be at least 1 metre from any flammable material and you must completely extinguish and safely dispose of all ashes and coals before the installation is moved or left unattended. You can use your outdoor wood burning stove or wood burning furnace provided you are within 100 metres of a dwelling you own or legally occupy. In addition, the stove or furnace must be at least 5 metres from any forest or woodland; at least two metres from any flammable material; and the stove or furnace must be situated on bare rock, mineral soil or non-combustible material extending at least two metres in all directions from the stove or furnace. You cannot have a campfire even in an outdoor fire grate, fire place or fire pit. The most important thing to remember about a Restricted Fire Zone is that open fires, including campfires, are illegal. The only exception is in organized campground and parks, where if strict criteria are met, the campground operator may allow campfires and charcoal BBQs but only during certain hours and under very strict controls. So, if you see a fire in a restricted fire zone (except in a campground or park) chances are it’s a forest fire and should be reported to the Ministry of Natural Resources right away. The sooner we can get to it, the better our chances of putting it out quickly. So look for and obey the Restricted Fire Zone signs, and report any forest fires to the Ministry. These are two positive things you can do to help us keep our forests green for everyone to enjoy.